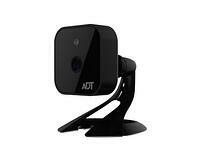 ADT Pulse cameras are a very affordable way for you to video monitor your home or business. These cameras work in conjunction with the ADT Pulse Tier II Monitoring Service. The HomeView ADT Pulse package includes an ADT monitored security system and an indoor camera. You can add up too 16 cameras total to your ADT Pulse security system. With HomeView you are able to see what is happening in secure, real time via the Internet from mobile devices or a computer from virtually anywhere. You also can receive video clips of events. Events are determined by you. You can set the ADT Pulse security system to send you video clips for all emergency alarm events, anytime the alarm is armed or disarmed, when the liquor cabinet or gun safe is opened, when someone enters your master bedroom, etc. The possibilities are endless. It is also super easy to setup with the very user friendly ADT Pulse interface. You have the option to have your ADT Pulse cameras mounted by our installer or you can place them on a table top or shelf. Going with the table top version allows you the ability to move the camera around your home depending on what you want to see in real time. It may be best to have some of the cameras mounted, like at the front door, and keep others unmounted to give yourself the flexibility to move the cameras around. What is fantastic about ADT Pulse is that you are in control of what you want in home security and what things you what to be notified of. Being able to see what is happening at anytime gives you added peace of mind knowing everything at home is fine. 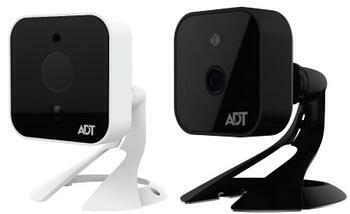 Starting in March 2014 there will be two options for the ADT Pulse Cameras. 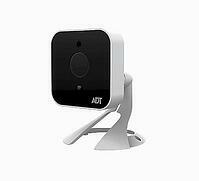 The ADT Pulse Indoor Camera is the perfect solution for indoor areas and this camera includes night vision technology. It is a very affordable solution to having video monitoring for your home or business. You will get a real nice image with this camera and it comes as a bookshelf camera or can be mounted. When you upgrade to ADT Pulse with Video Surveillance you will get one of these ADT Pulse Indoor Cameras FREE with ADT Pulse Level III monitoring. The ADT Pulse High Performance Outdoor Camera is the perfect camera for your front door. Keep the family safe by seeing who is at the front door before you open the door. You can view your cameras from the ADT Pulse Touch Screen Control Center, your smart phone, tablet and computers with Internet connection. Have cameras viewing the front yard, sides of your home, the pool and the back yard. Knowing what is happening outside is important to your family's safety. The outdoor camera is designed to be installed and mounted to the wall or under an eve. It is important to remember when deciding where you would like to have your cameras installed that they need to have a wire ran to an outlet for power. Both cameras come with motion sensor technology. This allows you to record a video clip anytime the camera senses motion. You can also have the video clip immediately text or emailed to you. This is especially useful for your front door camera. You may need to upgrade your ADT Pulse Cameras to a more traditional security camera system. ADT Pulse Video Monitoring allows you to view secure, real time video and get predetermined video clips of events. It does not record all the video. If you need to see recorded video of what happened at any given time over several days, a week or more, you will need to upgrade to a more traditional video surveillance system with a digital video recorder (DVR). There also may be situations where you need more than 16 cameras or want to install a camera that is a pan tilt zoom or vandal proof. All of these options are available with our ADT Video Surveillance Camera Packages. However, if you do not want to spend $3,299 for a traditional 4 camera system and do not need extended video recorded then ADT Pulse Cameras are perfect. By being able to see what is happening in real time from about anywhere and seeing 30 second video clips of events you predetermined you wanted recorded, ADT Pulse gives you the added protection of video monitoring. Of course, you get added peace of mind. For more information on ADT Pulse click here.